A term coined by Nugbuckets- an innovative grower whose observant nature led him to develop a technique that growers everywhere identify as Nugbuckets’ main-lining. This technique may have been around before Nugbuckets, but it’s safe to say that he took it to the masses in a highly engineered format. So what exactly is main-lining? The concept behind main-lining is to create a center off a single node, eliminating asymmetrical “stair-case” growth of branches and instead forming what to me resembles a field goal post. Every time I see a picture of a beautifully executed main-lined plant on Instagram I picture a tiny football getting kicked across. This structure allows for equal distribution of plant hormones, nutrients, and energy—every cola is a main cola! Picture a pine tree (a perfect example of apical dominance). Like medical marijuana cannabis plants, pine trees demonstrate an obvious dominance in the apical/terminal tip–the pointed end where the star tree topper sits on a Christmas tree. At this tip or terminal bud is where the highest levels of a particular auxin (a plant hormone termed indole-3-acetic-acid (IAA)) can be found. In plant physiology apical dominance refers to the control exerted by this terminal bud (or main cola) over the growth of lateral buds. So basically the terminal bud stunts any lateral outgrowth from other bud sites. While this model only has one main cola, mainlining creates a structure where apical dominance is eliminated and every bud site becomes a terminal/main bud. How does every cola become a main cola? Imagine having to feed an entire youth league team of growing, hungry football players that are scattered across the field. You find that it becomes a waste of energy to try and cover all the ground by hand-delivering food to every player. So instead you have them form two mirror-imaged lines that serve as efficient conveyor belts, delivering equal amounts of energy, nutrient, and most importantly hormone distribution to every single player. Main-lining is more easily achieved on cannabis plants grown from seed because of symmetrical growth. It could still be accomplished on clones, but it is a bit more difficult due to asymmetrical growth. Strains to consider using this technique on would be indica/ indica-dominant strains as they are heavy yielders and you’re really just beast-ing out all of an already “beast-mode” plant. Begins when you top your plant down to the 3rd node when she’s a good 5-6 nodes tall. 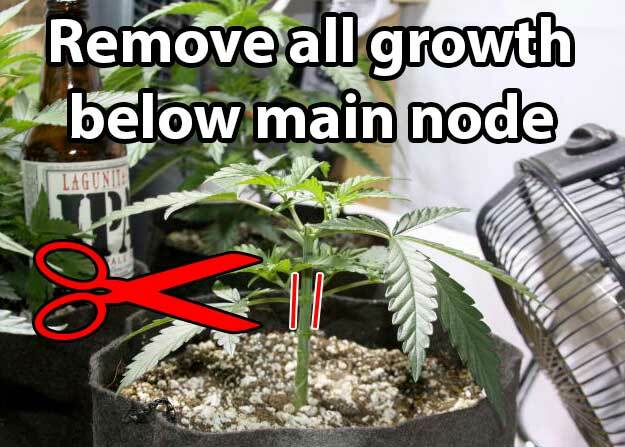 Remove any growth below her newly appointed main node. 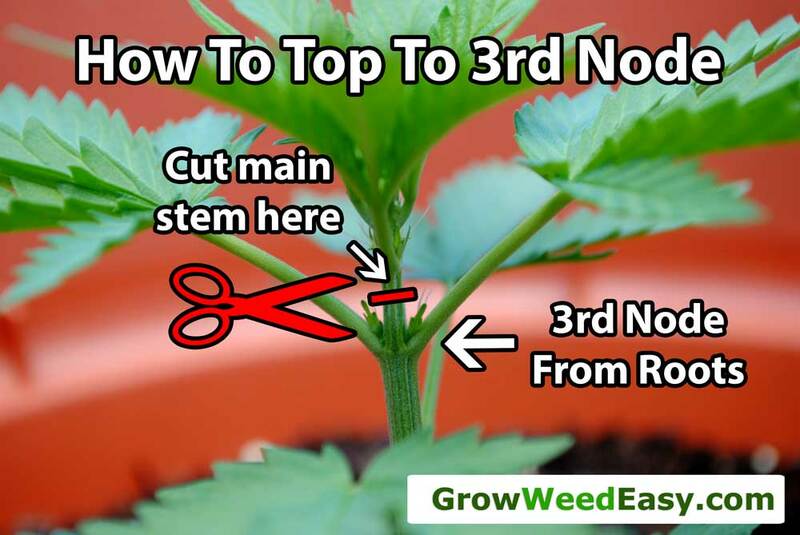 Your girls will begin to grow vigorously again and the topping can continue, topping the main colas symmetrically doubles the number of main colas. Repeat until reaching the desired number of tops you want. Bigger yields—since every cola is a main one you no longer have popcorn nugs! Effortless canopy management- with an even canopy, all bud sites optimize light (be it a bulb or the sun itself). Controls stretching—great for smaller-indoor crops stretched for lateral space. I hope this has helped; once again there is no better go-to grower than the boss himself, Nugbuckets. Check out this picture below, which can be found at here, along with a full tutorial. Happy growing!